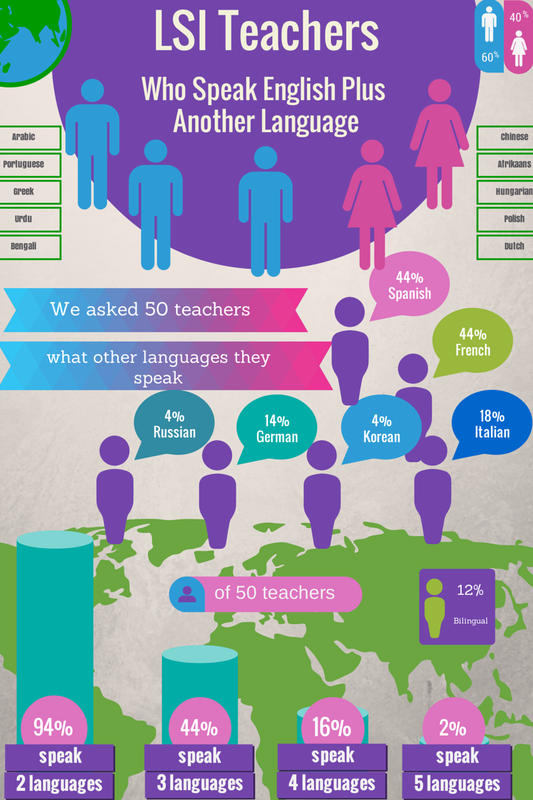 LSI Portsmouth Blog: How Many Languages Can You Speak? It's true to say that the teachers you find in a language school are probably a different breed to most workers you'll find anywhere else. At LSI our particular teachers are a multi-talented group of artists, musicians, sporty people, entertainers and authors to mention just a few of the skills. The question came up the other day 'what other languages do we all speak'? So, we conducted a very quick (non scientific) survey of the 50 teachers available at the time, asking which languages they spoke in addition to English, at a level of low intermediate and above. The languages spoken range from Arabic to Chinese! As you can see from the results below, not only are we multi-talented, we are also massively multi-lingual! What is interesting to see is that, according to this (very interesting) article which talks about the average number of languages spoken by the EU population, as a group, we are by no means representative of the country we live in, and are in fact, way above average! Which is always nice to know! We'd love to hear your comments - how many languages do you speak? What are the advantages in speaking other languages? Which is the most beautiful language to listen to?